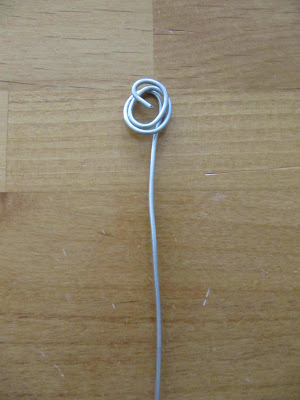 Sew Many Ways...: Tool Time Tuesday..."Wire" You Not at the Harware Store? Tool Time Tuesday..."Wire" You Not at the Harware Store? We finally had the fundraiser I was in charge of for the senior class this past Sunday. Love the students all to pieces, but I'm glad the pressure is over. I made all the center pieces for 15 tables and I thought I would share with you a couple ideas for TTT. Not much to do with sewing, but it can be adapted to just about anything. I wanted to use silk flowers that I already had at home. 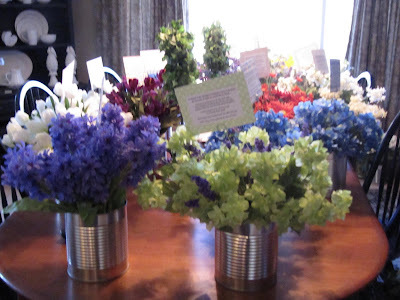 I keep them in big Rubbermaid containers and rotate the flowers out at different times...so I had enough. 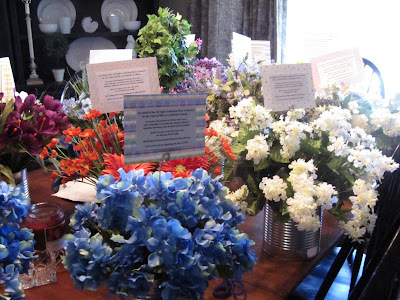 The committee wanted to thank the people who donated the food and the people who cooked or us, so I made thank you signs to put in each table arrangement. I just need something to hold it up above the flowers. So where else would I go, but to my husbands workbench! Ahhh...a big role of heavy gage wire. Perfect!. I didn't take any pictures of the actual making of them, because to be honest...it was 2 am and I think I was going blind at that point!! All you do now is just slide the paper (which was my thank you) in the loop and I was all set. 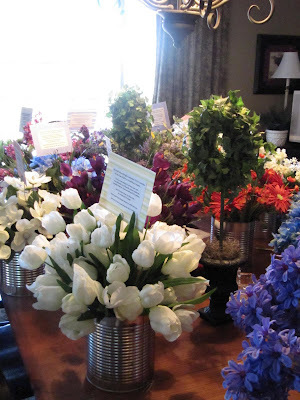 Here are all the arrangements waiting to go out to the car. I typed the note, cut it out and hot glued the corners to pretty scrapbook paper that matched each flower. The second part to today's Tool Time is the containers I used (in the pictures below). I wanted them all to match, but I don't have 15 matching cans. Where to go...to your local pizza place. I asked 2 pizza restaurants to save me their large metal cans that the tomato sauce or whole tomatoes come in. They were so nice about it..they even took the labels off for me and washed them. I told them what I was using them for and they were great about it. Aren't the cans so cute and the wire sticking out matched. You can use this idea for parties that you have...just make a sign that says Happy Birthday or Happy Anniversary and clip it to the wire and you're all set for a centerpiece. 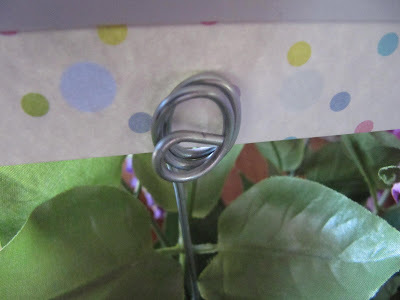 You can also stick the wire in a plant that you are giving as a gift and put a little note on it. Well, even though I used the project for 2 things...a fundraiser and a TTT, I'm glad I can share it with all of you. Just gorgeous - how creative! How fun!! I love both ideas. I love the BIG metal cans idea - I'm thinking now...(and that's a big step for me..thinking) how cute they'd be with a ribbon around them or an embroidered wide piece of fabric..cute, cute, cute. You are so awesome, Karen. What an inspiration to me!! They're beautiful Karen. You never cease to amaze us with your creativity. I wouldn't miss your TTT for anything. Love the idea! 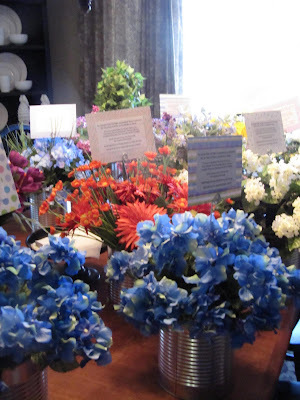 The arrangements look gorgeous. Those are great! Hope the class made lots of money! oh those flowers look luscious and the wires are a great idea too! 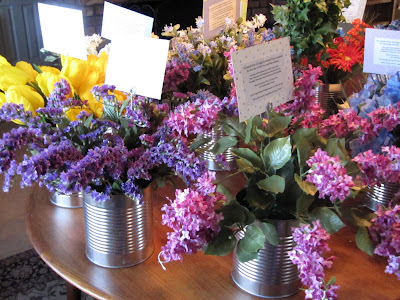 Cute flower container idea...those flowers look real by the way! Oh YOU! Darling as ever! The wire idea is great! 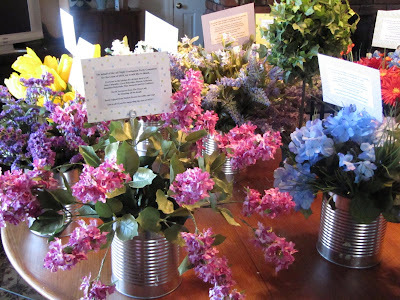 Your centerpieces look young, hip, and fresh with the metal cans.